Lodha NCP buyers, did you elect a CHAWL-DWELLER as Chief Promoter of your societies? 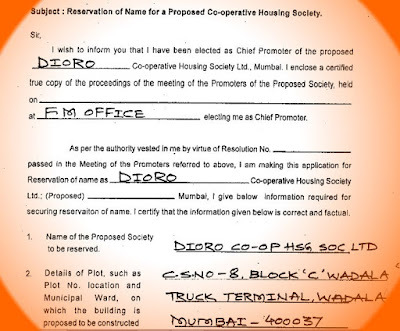 Mumbai, 8th December 2018: Going behind the backs of the flat owners and residents of the posh Lodha New Cuffe Parade, a Lodha employee named Vinod R Parab has submitted applications on behalf of Dioro, Elisium, Enchante (and maybe Evoq also) to the state cooperation department on 17th October, 2018. Lodha employee Vinod R Parab, who gave his residence address as "BDD Chawl, NM Joshi Marg, Mumbai 400011" claimed to have been elected as chief promoter by nine flat-owners each of Dioro, Elisium and Enchante. Many flat-owners, when contacted, said that they had no knowledge of their name and signature being on such an application!